Airplane hangars are typically leaky, high bay open-air structures with one large hangar door on one end to accommodate the sheer size of many aircrafts. When large hangar doors are opened, heat is quickly displaced with cold outside air. When doors are closed, the heating cycle must start all over again. In addition, hangar doors are not always well insulated and they allow a lot of cold air infiltration through gaps around the door. With traditional forced air units the process of regenerating that lost heat energy can take considerable time and uses up a ton of heat energy. Using radiant heat is an efficient use of valuable resources to reduce heating costs and increased comfort with in the building. 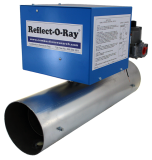 The Reflect-O-Ray®6.0 EDS product line is ideal for this application where the ceilings are 20ft or higher as it provides excellent coverage, efficient heating, and heat recovery when the doors are opened and closed. Reflect-O-Ray® 6.0 EDS also provides additional benefits for these extreme high ceiling. The biggest benefit over other competitors is that utility drop installations are generally reduced by up to 2/3rd’s. For lower ceiling heights we recommend using our Reflect-O-Ray® 4.0 EDS or Omega II® gas fired radiant infrared heaters. Many large open-air structures have the same characteristics of aircraft hangars. Warehouses, manufacturing facilities and auto service garages are perfect applications for a gas infrared radiant tube heating system or high intensity infrared system.